Lodi Shell Auto Sales and Repairs is family-owned and operated right here in Lodi Wisconsin. Since our company opened in 1990, we’ve treated every customer like they were a part of our family. Other companies may offer similar services, but our services are the best, and come with a personal touch. They pick up their new car, clean and ready to go! They know we'll rescue and tow them from ANYPLACE in Wisconsin! They also know that whenever possible, we'll make on-the-spot auto repair for things like needing a jump due to a dead battery, or delivering fuel if you're out of gas, or we'll repair your flat tire ... ALL ANYWHERE IN WISCONSIN! 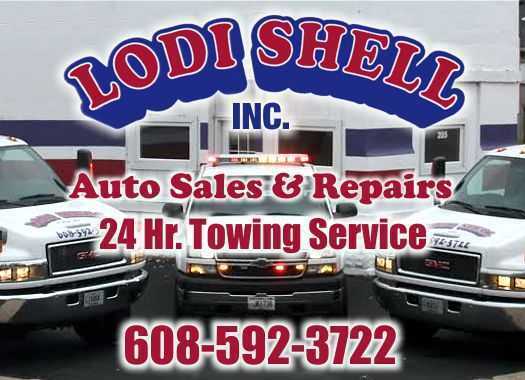 Page Summary: Lodi Shell offers used cars for sale, car dealerships, used trucks and auto repair shops near me. Products and services such as pre owned cars, used pickup trucks, tow company as well as used car dealers are also part of the scope of our business. We also specialize in auto shops, autos for sale in Waunakee, Poynette, Middleton as well as Dane. Other areas we serve include Lake Wisconsin, Lodi, Sauk City and De Forest. We also service Merrimac, Arlington and beyond.